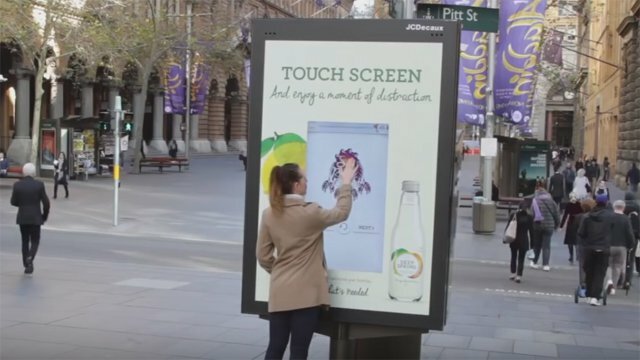 JCDecaux, an outdoor advertiser, recently teamed up with Coca-Cola Amatil's brand Deep Spring to deploy a digital coloring book in Sydney and Melbourne, Australia. Users were able to color Zentangle patterns found in many coloring books on the DOOH display, according to a press release. Coca-Cola is using this deployment to promote the relaunch of the Deep Spring mineral water brand. The interactive display is designed with a touchscreen so users can color in patterns that feature inspirational quotes. Deep Spring then shared drawings on its social media channels. "We're excited to see clients playing in the gaming space," Alan Klein, head of creative solutions of JCDecaux, said in the release. "Combine this with beautiful imagery, audience engagement and online/offline out-of-home integration and you see really exciting results like the Deep Spring campaign." The display is designed to emphasize Deep Spring's brand image of relaxation and "simple pleasures." The company deployed the display in high traffic areas to encourage pedestrians to stop and color. "It's great to not only be able to provide Australians with inspirational creative reminding them to enjoy life's simple moments, but also the actual tools for them to do so," Gaelle Boutellier, general manager of Coca-Cola Amatil, said in the release. The display in action is shown below.